Spreadsheet = collaborative online spreadsheet compatible with Excel and the OpenDocument Format. Let’s hope that the bandwidth the students have at university will be sufficient for them to use these apps! What is cool is that everything is powered by Linux and Open Source Software. Had it not been powered by Linux and Open Source Software, following your logic, it wouldn’t be cool, would it??? Why do i feel that google want to be the owner of the world? 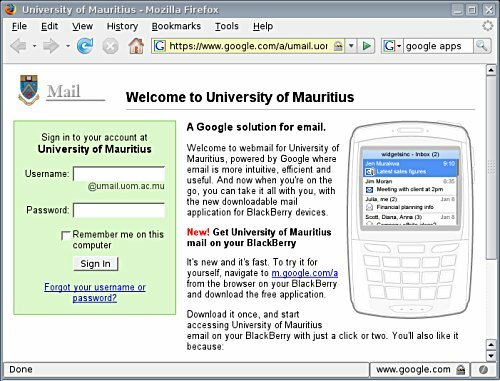 What will happen if… this ‘giving’ univ email to univ student is just a well planned step by google (who just happens to like innovative ideas) to have some sort of ‘project echelon’ type of system inside so as it can have an ear in whatever is happenning in universities? (since i believe universities come up with great ideas…), so google might just wanna be the first one to hear things? Okay you might wanna say its against the law and blahblah… but the business of google is to know everything and get everything first. google is almost as if imposing on ppl now! not, i myself use gmail, but this offering universities email is a major step in owning the world… then it’ll move to colleges, primary schools and down.. until finally when someone is born, google gives him/her a gmail account, and his birth certificate stamped “google”. Yeah, right?! I’m a pessimist. It harvests your data. Welcome to the UOM ‘google-cached guys and gals’. If you wanted collaboration etc, you’d have set up your own system – won’t be that costly. Have fun if you trust google. i don’t, and i won’t have my data mined! just because a web based application uses linux and oss does not make it cool. it’s all comes down to needs, features, extensibility, malleability, platforms and security features. What I know is that UoM evaluated both Microsoft and Google’s solution before choosing the latter. Previously, they were using their own mail server but they had so many issues that they felt that using something like Google Apps was extremely beneficial. […]until finally when someone is born, google gives him/her a gmail account, and his birth certificate stamped “google”. CITS has never been able to manage that mail server properly, and i can shout it loud enough, coz the number of security holes i have found since i got in that univ is just embarrassing! i wonder how they can be said CITS! One can even get execution privilege on that server.. thankfully at least that one bug report they fixed. So their decision doesn’t really make me at ease. Though i do trust google’s security and applications.. sinon mo pa ti pou servi gmail, what i fear is google’s apparently hunger for power. “And they use Linux and Open Source Software :-)” there use of opensource doesn’t mean they are leet :p probably because they have a great team and always aim perfection is what make em solid and trustworthy. If my lil brother tells me he has installed apache on linux on his box and is giving me free hosting, i will never host myself there, coz he’s crazy. While i might host my files there if you or ajay, pascal, or csyke or myself or someone who knows his stuffs did it. google is great and makes great solution, but still… too much power on one entity… is evil. i wonder if people do use their these mail accounts..
i’m not implying that you’re the one cause of the implementation. i don’t mind using live. it worked for me, for a while. the whole “don’t be evil” thingy is false. google is evil, just less evil than most companies. google is evil. i hereby nominate all of you (*cough* what? i’m deana, the great lol), “google-cached folks” who are easily tracked. W007 @ google going through the messages of UOM, displaying adverts (tired of blocking) amongst other things. it’s a sad news – you guys just killed a chance for you all to work on a project. try save the day and provide a better alternative. anyway i think its a bad choice coz our connection speed at uom is too slow and our server being remote doesn’t make it an easy option. login into my gmail account at uom sometimes takes about 15 mins. You’re right. I’ve been using Google apps too for about 6 months now. Because it works. I wouldn’t go as far “it works great”. but I least I have proper webmail for my websites without too much of a hassle. One big issue when running a webmail system is disk space. The UoM has 6000 students. Multiply this by 2Gb (which is what GMail is giving) and you’ll realise that we are talking about massive disk space. I don’t think anyone in Mauritius has this kind of money. So that’s why, I guess, CITS has decided to move to GMail. And, once again, Deana, you must realise that we are not talking about a toy web application here but rather something that might be used by up to 6000 users concurrently. I don’t know how to build such a beast. And I guess you don’t know either. Do a little bit of research before talking of something that you don’t know. I think that CITS has took a good decision to reject Micro$oft’s offer. as far as for POP access on this account with Outlook, I’m having prbm with this too. Congrats for using Google but does it make any significant leap or difference for us? Hardly I guess. What’s UOM mail anyway?, you’ll hear all the time, even from your CSE students! You have to agree most of us STILL use Hotmail and Yahoo heavily, even for sharing project work or any academic-related document. What can you do to change that? I remember student mailing lists (for my CS class at least) hardly bearing any address with the very distinguishing @mx.uom.ac.mu (It’s still accessible here at http://mx.uom.ac.mu/src/login.php and guess what’s to become of it). And what about the speed? MX servers were surely very fast since they were hosted locally. Do you think our labs are sufficiently well equipped with ‘decent'(don’t mention ‘high-speed’ because of the lamentable state of our network infrastructure. CITS have a good look at that!)connection. I too wonder how you are going to use Gmail with the kind of crap bandwidth you have in labs..
One nice consequence of using Google Apps is that we’ll be able to work collaboratively on documents and spreadsheets. I’ll have to think of ways to leverage that. does CITS have access to these accounts? We will also be able to get major linux distros to redirect mauritian users to queue a download here instead of everyone downloading it..
:p feasible? Besides, it could be an interesting class project for all the CSE department.. atleast we can go out of the univ with the happy feeling that, “hell we contributed something”! As far as I know (and I know a little bit about Google Apps as I use it with noulakaz.net), CITS creates accounts and assign passwords to them. Students are free to change their password but CITS can forcibly change the password again. So, theoretically, yes. CITS can change your password to 123, login to your account and read your secret emails. But, frankly speaking, I can’t see them do that. It’s nice to know that Gmail is working correctly in the labs. By the way, this idea of having a Linux and FreeBSD mirror was first suggested to me by Dominique Derrier of LinkByNet. He wants you to know more about Linux. I am currently working on this. I’ll let you all know in a few weeks if we are going to have an Ubuntu mirror (that’s what I am working on) on the 2Mbit/s network which exists in the island. Stay posted. i tried the java app for gmail on my phone… it works great… even though i aint got a blackberry..
but then again, since i do believe most of us got gmail accounts, its a wager we are willing to take, even unknowingly. weirdly nope, it works quick, though loading the real gmail.google.com page takes lots of time. (thatâ€™s what I am working on) on the 2Mbit/s network which exists in the island. Stay posted. Hmm, seems interesting, can i join in that project? mx.uom.ac.mu was far better than that gmail.. we don’t even get access to it from home now.. but i think its available on the intranet connection at the campus..
Pff… really boring.. i don’t even get “notice emails” from the faculty / or student union etc on the gmail either..
and the student union is praising themselves for that “achievement”.. I personally dont need 2gb space email for a university email account.. there’s yahoo, msn, gmail for that..
What do you mean you can’t access your email from home? Surely http://www.google.com/a/umail.uom.ac.mu/ works! Hi, I’m a uom student and I reached your blog by searching “mx.uom.ac.mu” on google…. And if yes, is there a link or something to start using that mail? (1) Yes. All Google apps (like Gmail, Docs, Calendar, etc) can be used. Hi! Avinash , came to meet u some times back looking for ur help to start msc ict final project! U remember! we’ll , need some reasearch material on blackberry , me embarking on a project on blacberry simulation .Plx help ! Hello, I tried to log in on my mail using this google thing, but each time it says password and username do not match. Why is it so?